I had a job interview this afternoon. I am extremely happy with the job that I´m starting in June but this opportunity presented itself, practically fell from the sky 🙂 I thought I would go in and see how it is to be interviewed in English, in Canada 🙂 That was my first interview here 🙂 There has been many firsts this month. So what do I do when I don’t feel like myself (sad, angry or disappointed), I bake! Here is what I whipped up. This is the best time to bake, most inspirational! TOTAL TIME: Prep: 25 min. Bake: 25-30 min. In a large bowl, combine the flour, oats, brown sugar, baking soda and salt. Cut in butter and cream cheese until crumbly. My kitchen aid did the job for me. Press into any baking dish, set aside. I used a round pan. 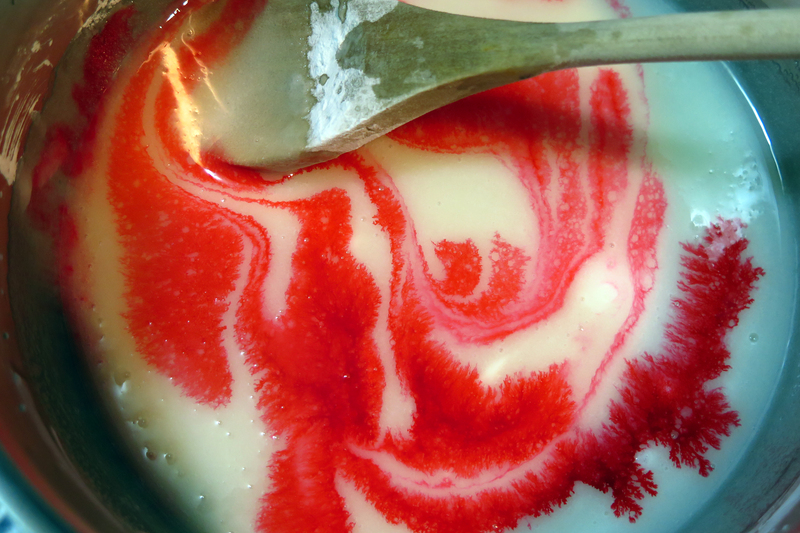 In a saucepan, combine sugar and cornstarch, mix. Stir in cold water until smooth. 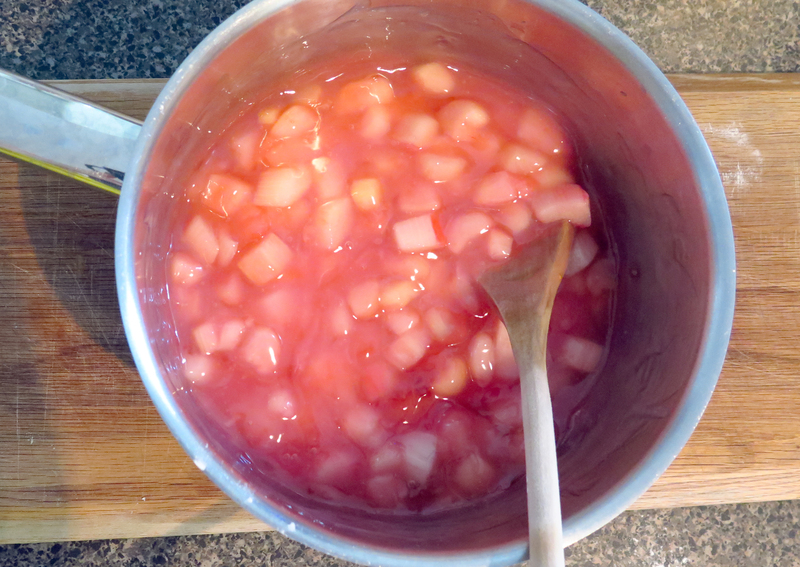 Add rhubarb, vanilla and food coloring if desired. Bring to a boil, cook and stir for 5 minutes or until thickened. 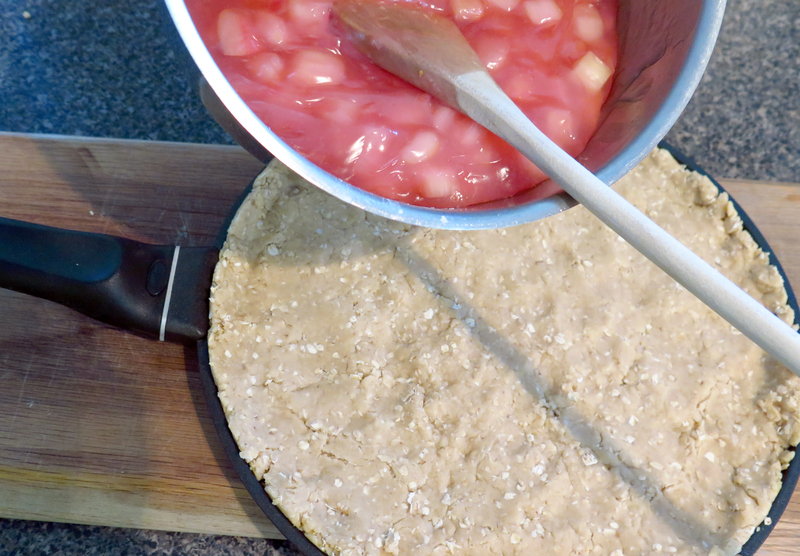 Spoon the rhubarb mixture over the pressed crust and sprinkle with remaining crumb mixture. 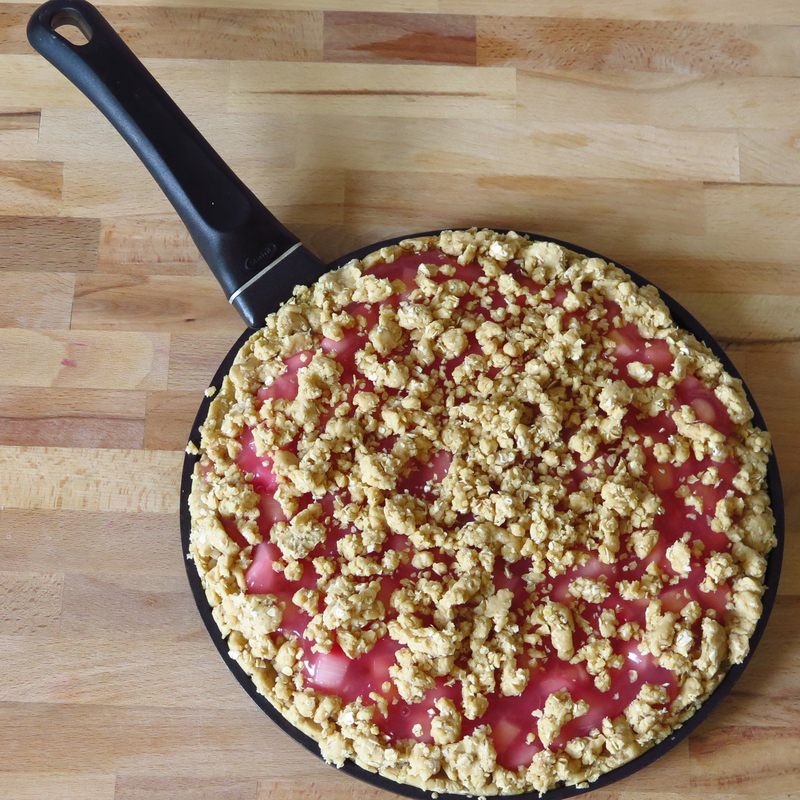 I love rhubarb in general, so everything with rhubarb to me is awesome. 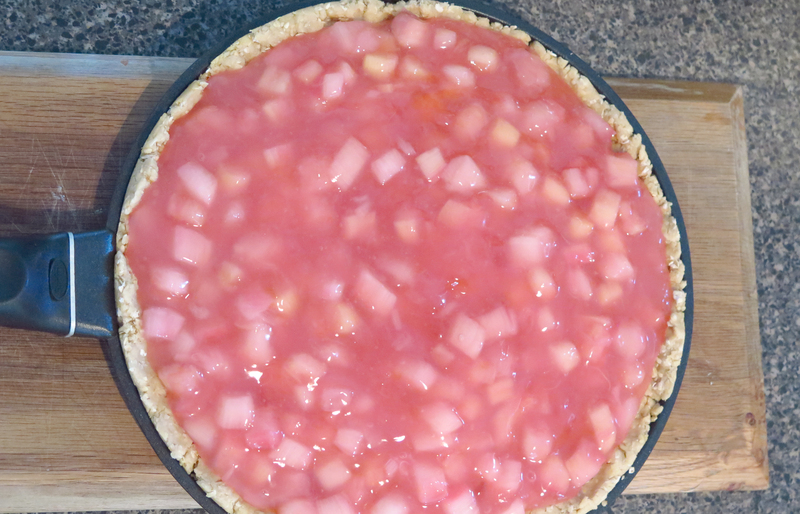 If you love rhubarb, you will love this yummy dessert! 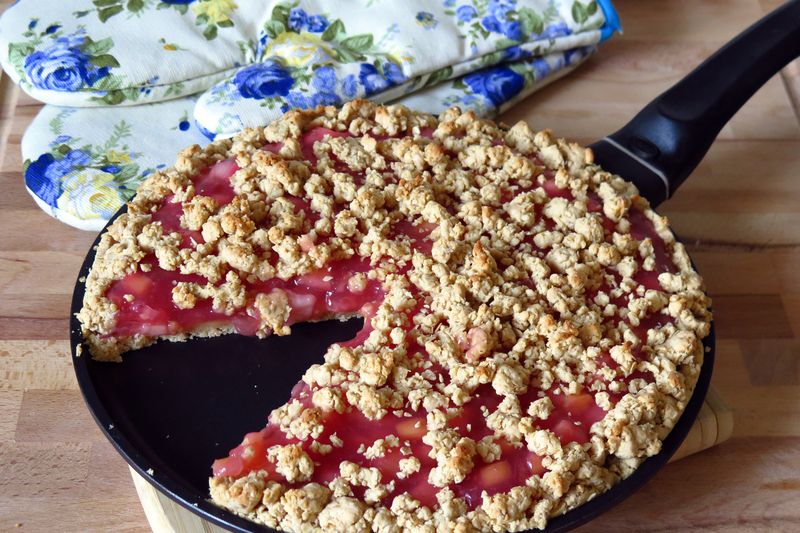 It is more sweet than sour, if you are scared of the sourness of the rhubarb! yum. This looks so pretty. I am now on the search for rhubarb. Every year I can’t find any, so if I find an abundance this year I may freeze some provided they freeze well that is. Roncesvalles has the best juiciest rhubarbs in town right now, if you are interested 😉 I also buy a bunch and then freeze, because there´s only a few months of rhubarb season. I’m passing this recipe on to my co-blogger, Oli. Everyone in Iceland has a rhubarb patch. Thank you, Gina! This was the best rhubarb cake I have ever made!